Spelljammer could have used more art like this. It feels like something is happening in this picture, rather then just people standing around. official art. 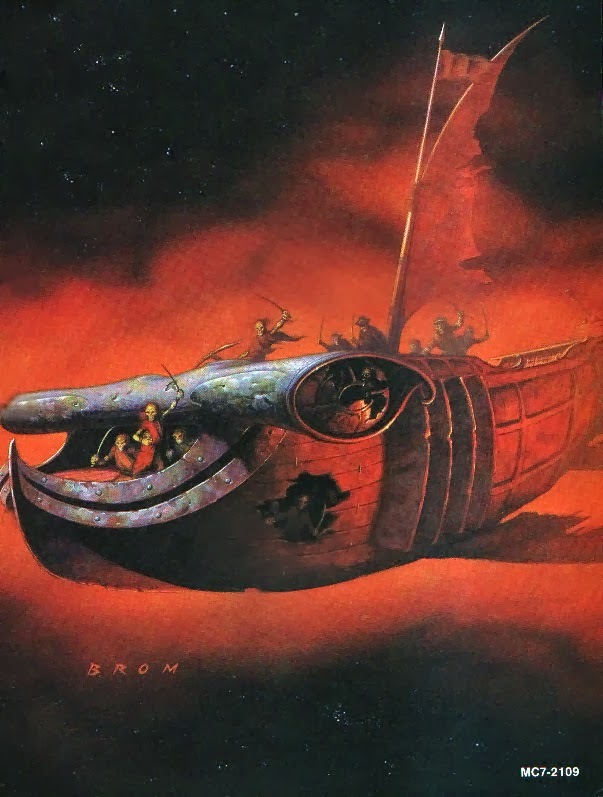 For example, I did not know that Brom did Spelljammer art. It also shows off some of the problems with the art: Designs that didn’t match the rules, or descriptions of the ships, a lot of the art being reused too many times to save costs, and some of it being um, rather bland to be honest. You’ve got a swashbuckling setting with people leaping from ship to ship, and most of the art just has people standing around. I agree– the art was very underwhelming in most cases. So much potential that wasn’t tapped into. It makes any decent art, fan made or otherwise, something to covet! I’ve been using Tumblr to post up a bunch of Spelljammer looking art I’ve found. Might be worth checking out if you want more. The sad thing is this shows how cool the art for Spelljammer COULD have been. Much like with Firefly, the few people in love with the setting seem to be in love with the potential of the setting. I feel this is pretty accurate to how I like the setting, though a lot of people on the old SJ Mailing list (now a set of forums) like the setting as written a lot more then I do.